Small shrub with wavy, grey leaves and clusters of rose-pink flowers, about 5 cm across. It takes harsh mediterranean conditions and frost to about -12 C. Cistus x Pulverulentus is a garden hybrid, obtained by crossing Cistus albidus x Cistus crispus. 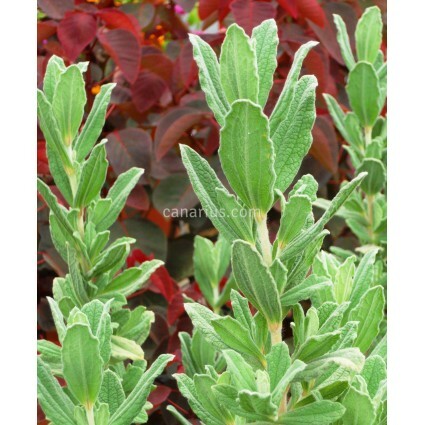 It has an extended flowering season, much longer than the average Cistus. Small shrub with wavy, grey leaves and clusters of rose-pink flowers, about 5 cm across. It takes harsh mediterranean conditions and frost to about -12 C. Cistus x Pulverulentus is a garden hybrid, obtained by crossing Cistus albidus x Cistus crispus, two species native to the Western Mediterranean. It has an extended flowering season, much longer than the average Cistus and a showy robust foliage. It responds well to regular trimmings.